‘Don’t let yesterday use up too much of today’ – Old Cherokee proverb. Twitter is a fascinating resource, an eclectic mix of the wondrous, informative, witty and bizarre, it provides a window into so many different peoples worlds and experiences. Sometimes things appear in my timeline that particularly strike a chord, the quote above posted by @NativAmProverbs early in the New Year seemed particularly apt when my mind has been so full of reflection and assessment of where I am as an artist. 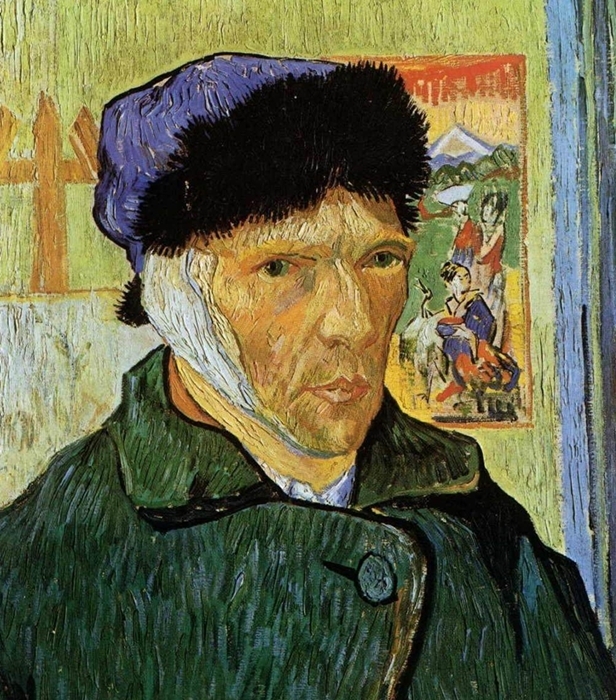 Vincent Van Gogh’s, ‘Self Portrait With Bandaged Ear’ has become one of my favourite images, it reminds me that an artist’s lot is not always a happy one. Like many individuals, businesses and even countries it has been challenging times over the last few years since the recession first hit in 2008. Change has not always been easy, difficult times have forced onerous decisions with all the knock-on effects that has to self confidence and assurance in one’s abilities; mistakes have been made and consequences have to be lived with. Rather than making me feel down though, his painting strangely uplifts me, like the old Abba song ‘The Winner Takes It All’ – through the power of creativity and art, sad subject matter has been transformed into a life affirming joyous thing. So as 2013 begins I have decided that the Cherokee proverb will be the resolution upon which to base the forthcoming year. In the past I was in the very lucky position that I never really had to actively look for work opportunities, it always seemed to have its’ own momentum, the flip side to that unfortunately has been that it proved to be a weakness within my practice. As work is nearly always commissioned it means I have always been reactive rather than proactive. This year my aim is to work upon that weakness so that control of what I can achieve is brought into a better balance where I can to a certain extent become a catalyst for my own business becoming more sustainable and not being so dependent upon external factors. Self promotion, networking and creating a public profile are alien concepts to many artists, being naturally reticent this is an area that I have concluded could be very easily improved upon. Social media offers new avenues of connecting with like-minded people and clients. Last year I worked upon two main projects and set myself the additional task of getting a new web site up and running and getting to grips with this blogging malarkey, hopefully I’ll get quicker and better at it! This year my plan is to explore different avenues of working and actively seek ways to ensure that I am not ‘invisible’ I hope any readers will check back to see how the year progresses. 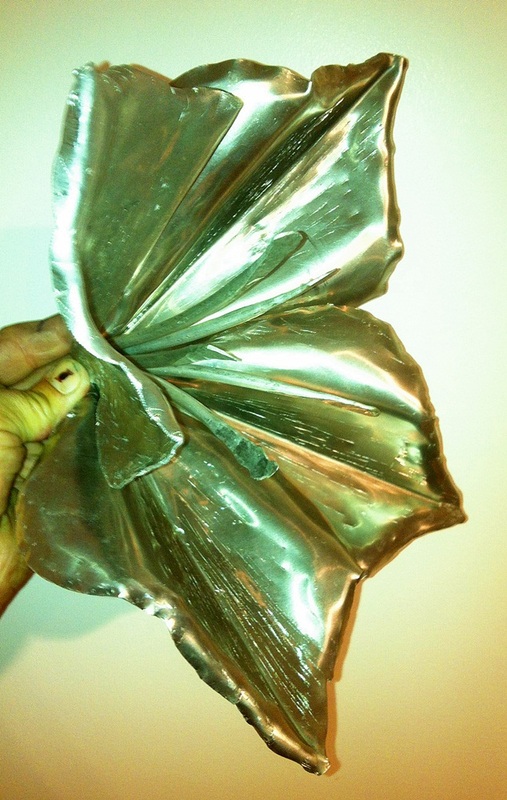 After much hammering, bending and welding the 33 individual lily heads for the City Square Lanterns are now complete. Heading off to the powdercoaters in the next few days I’ll be installing them on site early December. Making work to commission each new project poses different challenges, one week you are a dry stone waller the next a metalworker. Responding to the required changes of approach and mind set I have always found rewarding, variety being the spice of life it means you never get bored, mundane chores are tempered by knowing that a more interesting and fun activity is just around the corner. Tasked with providing an additional series of 10 lanterns for Dundee City Square, the week ahead will be filled with making nearly 100 ‘lily petals’ to be attached to the lantern brackets. Situated around City Square the completed wall brackets are part of the street furniture of Dundee that I designed nearly 20 years ago. Dundee’s City crest includes three lilies and these were a major element included in the designs. Earlier wall lamp brackets were made of mild steel, the Council really like the bracket but have proved in hindsight to be rather heavy to install, the updated ones are being made from aluminium a much lighter material which has eased their installation. 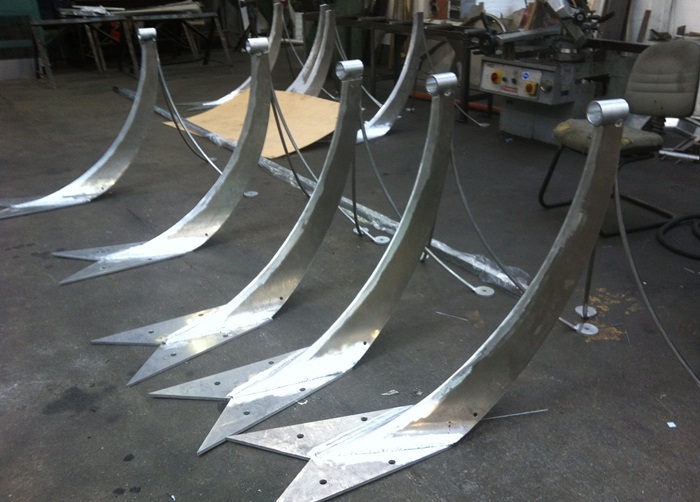 Main elements of the bracket have been laser cut and assembled by Mcgarries, metalworkers in Perth. The Lily detail of the originals were hand forged and now also have to be replicated in aluminium, which I am undertaking. 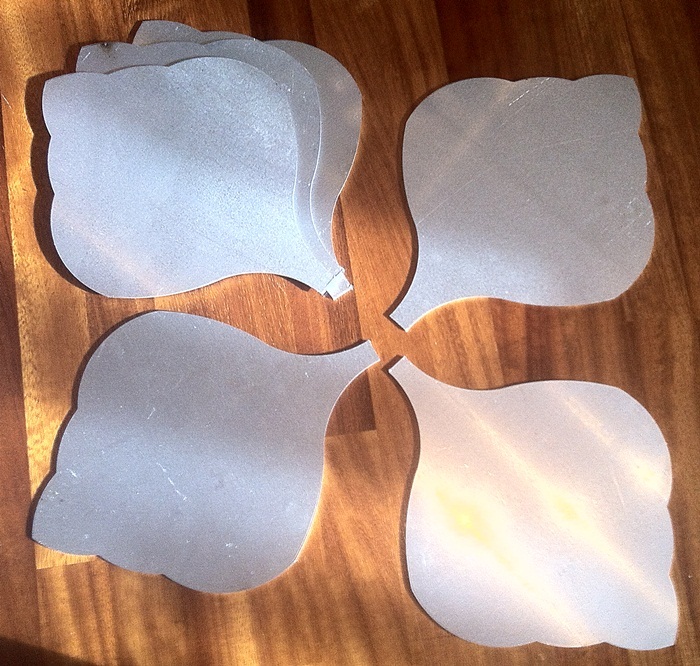 Working from a basic ‘blank’ cut out shape made from 1 mm thick aluminium I am using a variety of forming techniques to create the 3D flowers. Having made a couple of prototypes I have settled on using only three petals for each Lily as I think this gives the easiest ‘read’ flower given that the wall brackets are 8 meters above street level. When designing a project the end goal is always in your mind’s eye; how the scheme will work within it’s surroundings and ultimately be viewed and used by ‘it’s’ public. 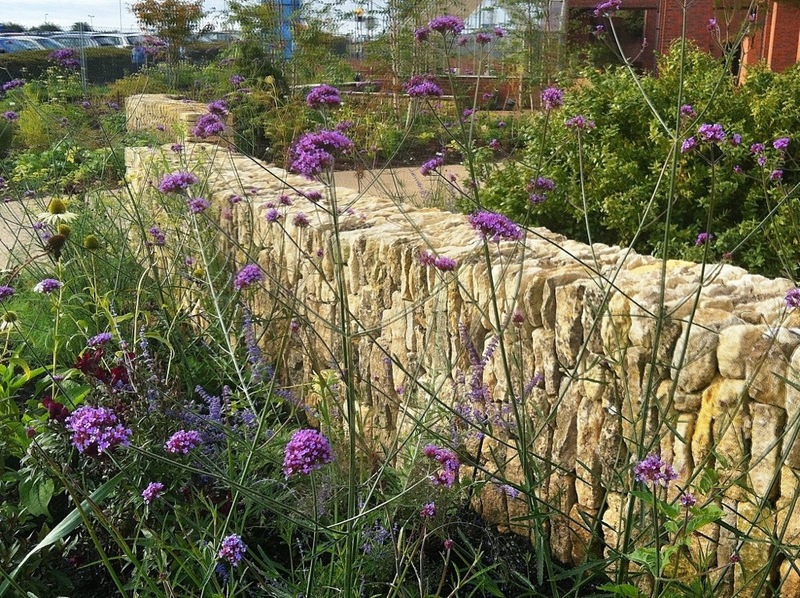 Uppermost in my thinking for walling projects is a desire that the walls should work in harmony with the soft landscaping so that they become one, each element contributing equally to the overall effect. 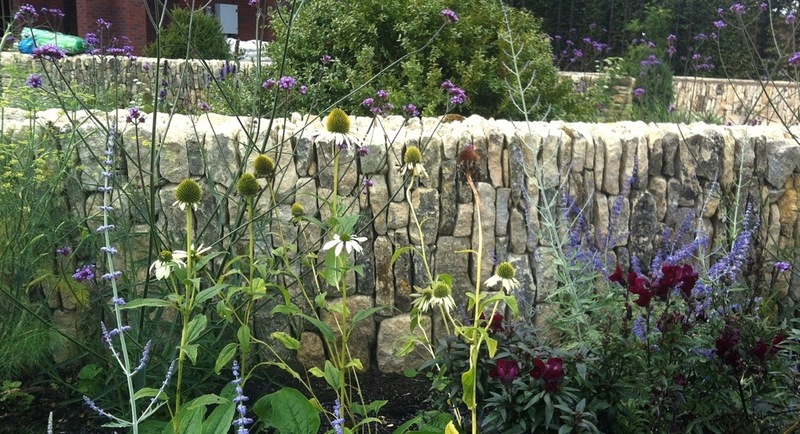 Walls provide the structure for the design and the planting settles them into the site. 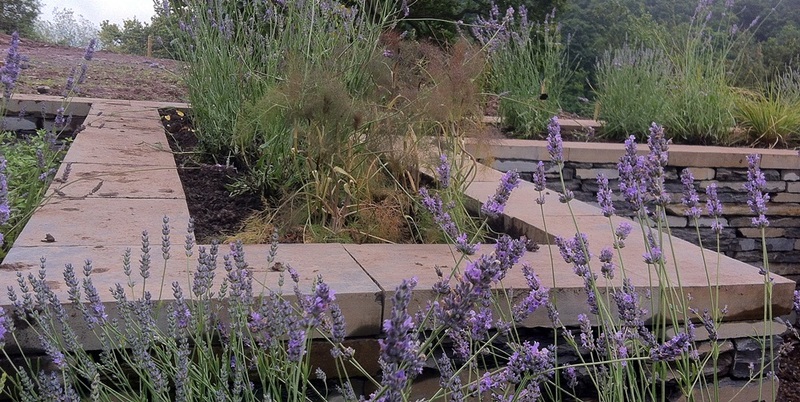 Initially after being built the walls are stark and dominate as the planting takes time to develop, so upon completion there is always a sense of it only being half finished. Therefore it is very satisfying to return to see a project at a later time and find it exactly as one had imagined, established into it’s environment. 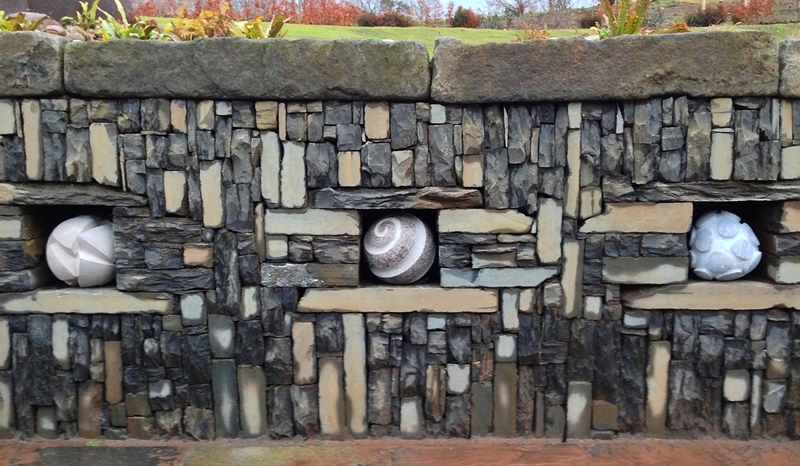 Completed in 1998 the entrance wall scheme I designed and constructed for the RSFS Forestry Trust at Cashel on the banks of Loch Lomond was built dry stone, from a rough whin stone, 14 years later it has now taken on that lived in look that can only be achieved with time. 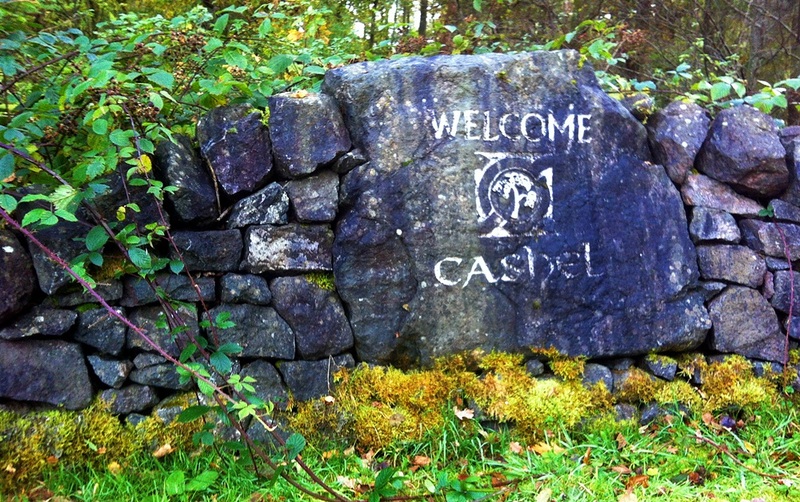 Situated at a point on the West Highland Way the scheme acts as an entrance announcement to the Millenium Forest being created at Cashel and as in informal stopping /picnic spot for the nationally recognised trail. icloud, cloud computing, cloud storage, soundcloud, ‘The Cloud’ – these terms abound at the moment defining some element or service associated with the internet, but why ‘cloud’? Why choose a word for ‘a condensed mass of water vapour within our atmosphere’ as a metaphor to describe one of the most important developments for human society in a generation? 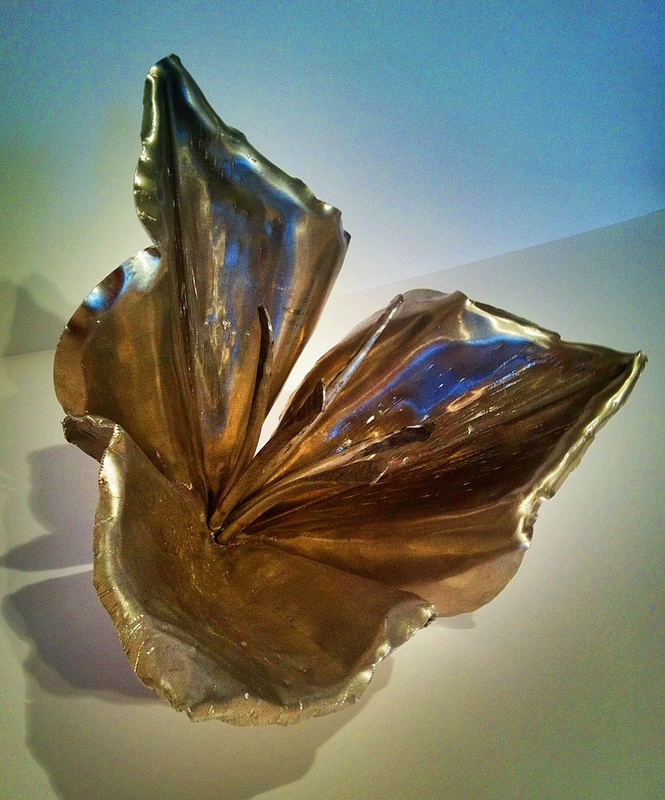 and what concern is it to a Scottish artist/waller? Rather smugly, perhaps, I believe there is a direct link to the use of the term and myself! Observant viewers will have noticed that my logo is a carved ‘cloud’ which I undertook within one of my very first public commissions, a garden wall for Meadowside St Paul’s Church in Dundee. Which to me, is a rather tenuous theory. Trawling further around the internet to see if anyone understood the true origin of the term (as defined by me!) I discovered that there was great debate and controversy as to who used it first and that it is of considerable monetary value to the likes of Apple & Google. Trendy buzzwords have been a feature of ‘tech-speak’ ever since the first chip was attached to a board, my personal favourite has always been a TWAIN device, used usually to describe an external component that connects to a computer, it stands for – Technology Without An Interesting Name! 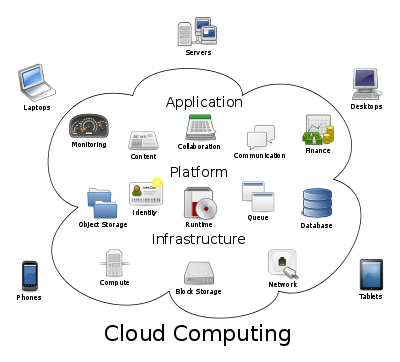 ‘Cloud’ is just the latest word used to describe some part of the diverse world associated with computers and technology. But why it and not something else? Consider what the word has to encapsulate, the vast network of computers and servers that make up the internet. A worldwide bank of human knowledge, resources and services, everything is now ‘online’. Consensus by use appears to now reign but why ‘cloud’ and not something else that describes a vast untouchable thing – Galaxy? Universe? Milky Way? Surely there must be a more significant profound reason for it’s use other than a dodgy sketch around some computer terms. Correctly attributing the origin is obviously an important matter and as no other source has put forward a believable hypothesis it seems incumbent upon me to enlighten the debate. Many years ago whilst still at Art College I purchased a book from a stall selling ex library stock, it’s sub title intrigued me – ‘A Humanist Account of the Space Age’. Purchased for little more than a few pence the book has had a profound effect upon me and my perception of the world and society. Written in 1970 by Loren Eiseley – Benjamin Franklin Professor of Anthropology and the History of Science at the University of Pennsylvania in Philadelphia. ‘The Invisible Pyramid’ is a series of essays that eloquently describes the rise of man from ‘forest dweller’ to the present day ‘space age’ Using mythical metaphors, describing the sun as ‘The Star Dragon’ he explores fundamental questions and theories about the human condition, our relationship with nature and our place in the cosmos; it is a beautiful book written with ‘imagination and grace’. Following the evolution of man he discusses factors that have contributed to our species alone developing beyond the natural world – ‘Man is no more natural than the world. In reality he is… the creator of a phantom universe, the universe we call culture’. His concepts are stated non religiously but neither does he in a Richard Dawkins way attempt to debunk organised religions, he leaves the way open for his insights to be interpreted by the religious with equal relevance and meaning. Science and religion are two faces of one coin, both are attempts to comprehend, rationalise and explain our genesis, ‘first cause’ – God or nature and our subsequent existence. This singular power; to be able to process the world internally and then express it externally has freed man from the ‘prison’ of the natural world. Free to imagine things past and things still to come, free to use this imagination to shape the world to his own will and then to record and share those experiences. Initially this was passed orally. As mans world expanded his knowledge grew, so too did the need to have a tangible method of saving what had been gained and so written history emerged. ‘Man is not a creature to be contained in a solitary skull‘ – the internet is just the latest technological development of mans desire to record his existence. Loren Eiseley’s thesis is that the human brain and communication has allowed man to become – ‘the creator of a phantom universe, the universe we call culture – a formidable cloud of ideas, visions, institutions which hover about us, indeed constitute human society, but which can be dissected from no single brain’. Is that not an eloquent summation of the internet? This I believe is the true source of the use of the term ‘cloud‘. After I had completed the carving I thought it was an ideal symbol to use to define what I was all about, that there was this latent outside force, creativity, that was alive with future ideas and potential that I hoped to tap into with my artistic practice. Now that I alone! – have proven the true origin of the term – is there money in it for me?? 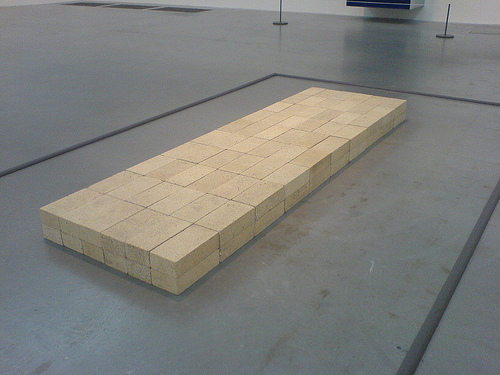 Equivalent VIII by Carl Andre – Ruminations upon. Considerable concentration is required whilst constructing a stone wall but occasionally the mind drifts, the infamous ‘pile of bricks’ correctly titled ‘Equivalent VIII’ by Carl Andre was a subject that diverted mine on occasions last week. It then occurred to me this is the true nature of the beast that is stone walling; whenever or wherever stone has been used, since man first picked up a rock and placed it upon another to create some construction they have been at the mercy and vagaries of the material available. 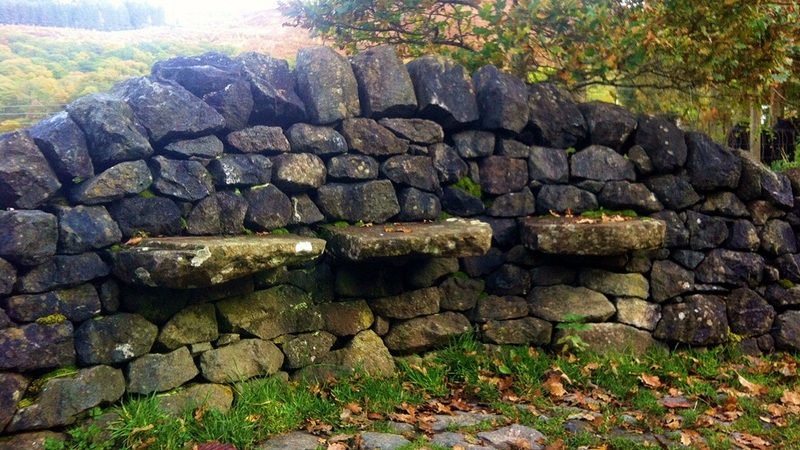 Stone by it’s nature is an organic and random material, it’s final aesthetic beauty when touched by mans skill often belies the sheer physical and mental endeavour required to transform it from the heap of raw material. Difficult to collect and move about, awkward shapes and sizes, riddled with imperfections and flaws, dirty and dusty, requiring discipline and application to work, stone is when you consider it rationally not the ‘perfect’ building medium. It is surely not difficult to imagine many instances across the ages of the frustration caused by the stone not being ‘the best’ or different from what was desired. A major example being the Washington Monument, it changes colour halfway up as the builders were unable to source the correct stone after an enforced hiatus in construction due to the American Civil War. 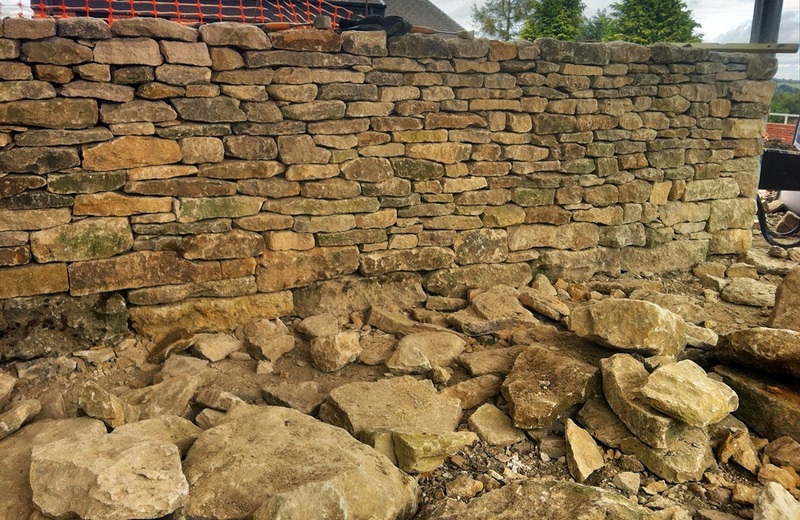 Dealing with the inherent characteristics of stone is what the waller does that is their job, but we all desire an easy life and would prefer ‘good’ stone in preference to bad. 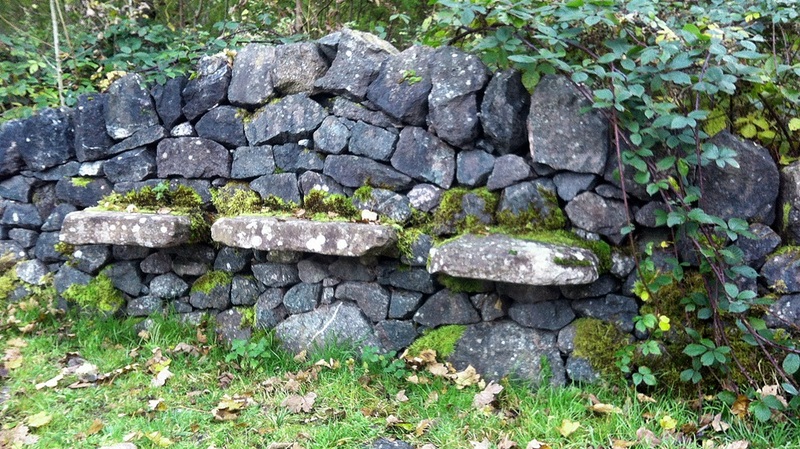 So filling the barrow with whatever came to hand I started using the stone available to build the summer house wall. It is difficult perhaps for the non waller to understand what constitutes a ‘good’ stone over a ‘bad’ one, to explain a ‘good’ one fits with the minimum of effort at the right time and makes subsequent building upon it a simple affair. 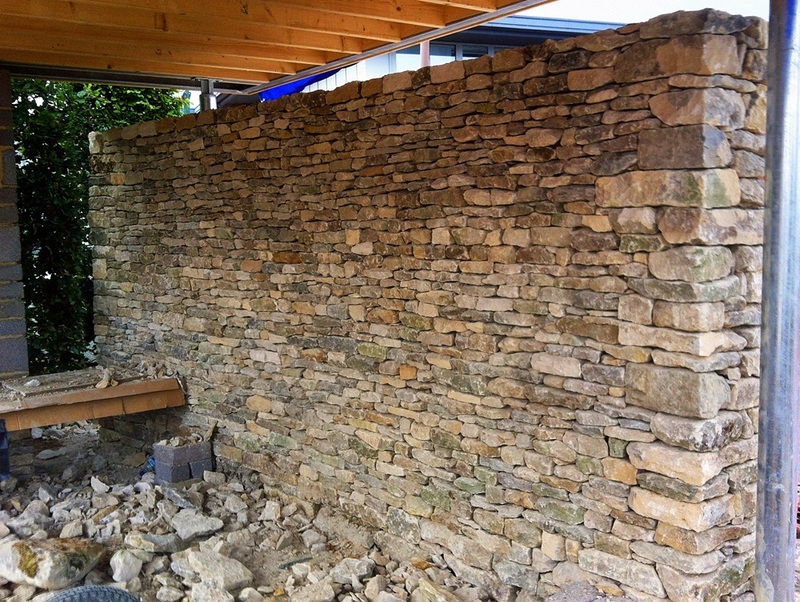 A ‘bad’ one shows no potential when lying in front of you, when you pick it up it has no ‘face’ (the desired surface that will be visible in the completed wall) and does not want to sit well upon the previous stone laid. Solving and controlling these issues is central to the wallers art, a constant battle between the material and the waller, let the stone dominate and you will lose, the completed wall will show who won the contest! Good walls have tight fitting joints, consistent coursing with a flush finish to the outer surface. 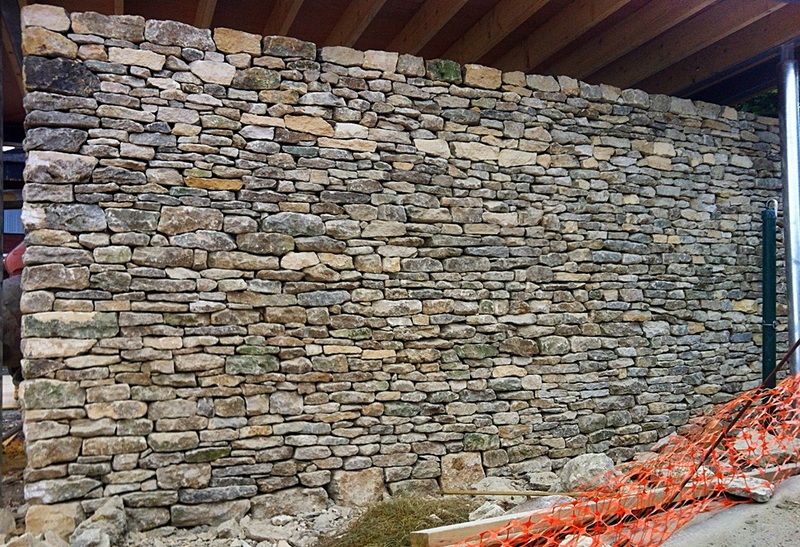 Lazy and incompetent builders compensate for the stones inconsistencies by using mortar – sometimes loads of mortar. Experience and endeavour are required to achieve the best results, the will of the waller must succeed over the limitations of the material. 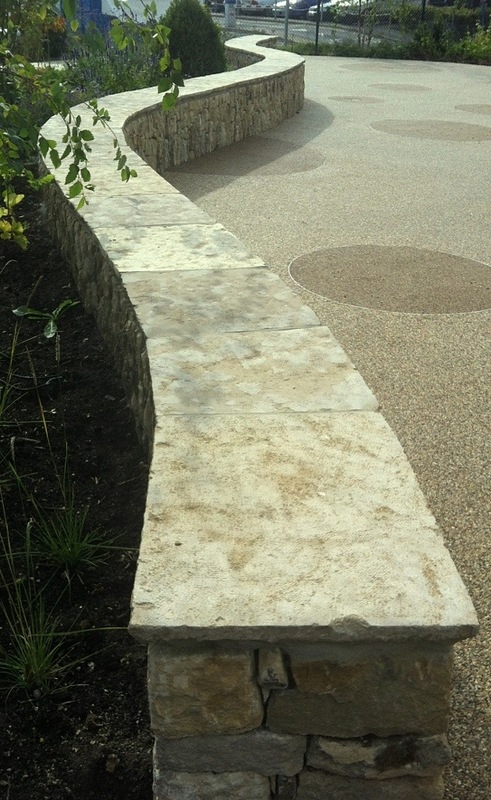 Attaining the skill level required to work stone to a quality finish takes many years of practice and experience not easily gained as this definition proves – ‘an expert is someone who has made every possible mistake in a very narrow field’. Trying to pass on that knowledge is not an easy task, training others to get their own eye in to the potential of a pile of stone can take years with many never being able to achieve great results. So stone is a material that has many issues, it is an inconsistent difficult material which takes time to learn and a high degree of skill to use well, it was this train of thought that opened up my eyes to the sheer brilliance of Carl Andre’s bricks. Was the invention of the brick a truly inspirational ‘eureka’ moment related to the use of stone. 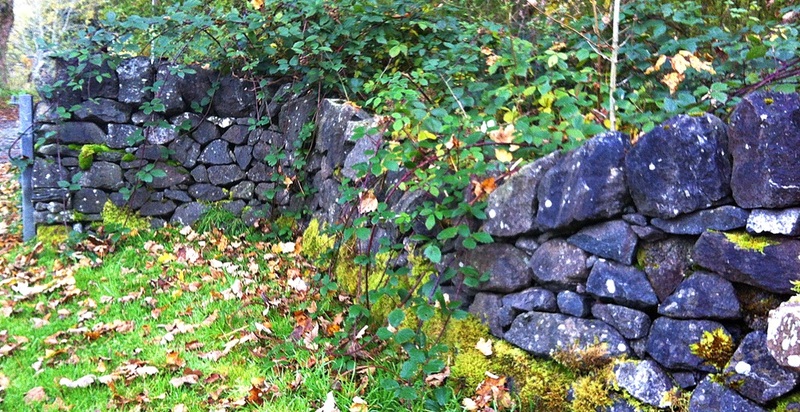 Dreamt up by some frustrated foreman on some ancient site, possibly Mesopotamia? Under pressure and fed up with progress and problems caused by the stone and the masons at his disposal? How many hours had he tossed and turned in his bed cogitating over the cause of his vexation? 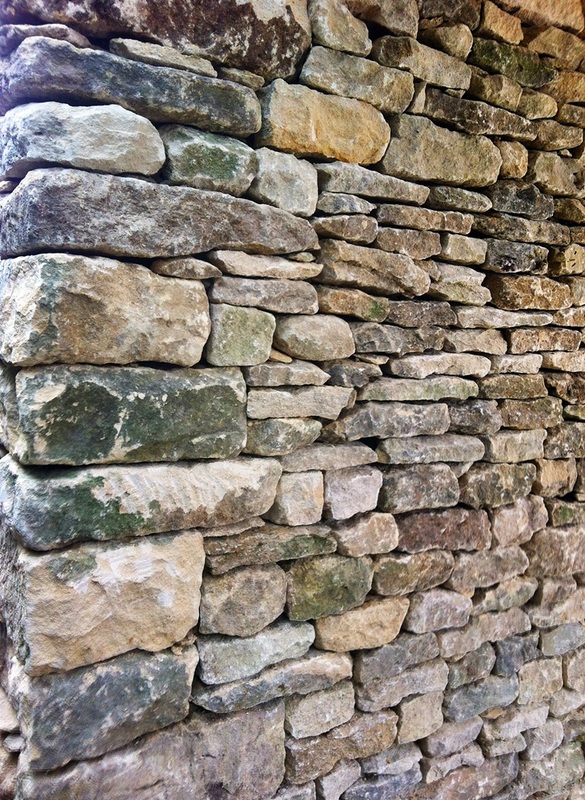 The genius of his solution is beautifully captured in the sculpture ‘Equivalent VIII’ Presented before us is the truly game changing innovation of the age; man made, consistent, regular, clean, hand sized, easily stacked & moved about, requiring no special skills or eye to build, everything that stone is not. It illustrates perfectly mans desire for control and order. Mathematical in origin, it’s width is half it’s length, a brick must surely be one of the first innovations of mans that allows him through sheer ingenuity to break free from the restrictions imposed by the natural world. With ‘The bricks’ Carl Andre presents us with this amazing ‘WOW’ moment. It reveals fundamental truths about the human condition the need for control and order and in a minimalist way it is open to interpretation, encapsulating many ideas and concepts whether he had the stone connection in mind – who knows. Being a waller, using stone all the time despite it’s intrinsic difficulties all I know is I love to use it, I relish the challenge and nothing gives me more satisfaction being able to walk away from a completed wall knowing that my skill and effort won over the difficulties and each stone used deserves their place and is shown to it’s best, there for others to look at and enjoy. Give me stone over brick any day!! 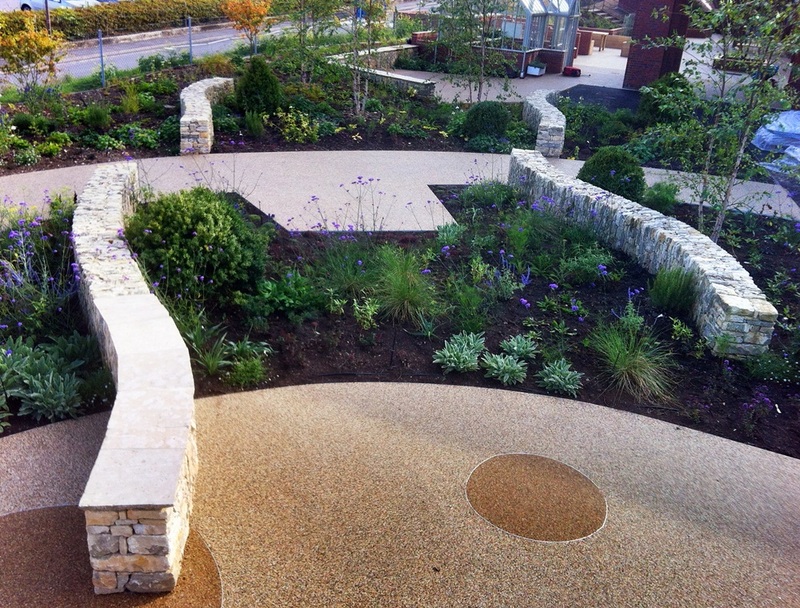 Back down to complete the walling works for Horatio’s Garden at Salisbury Spinal unit. Designed by Cleve West the garden is nearing completion – when I was last here a few months ago there was mud everywhere, Martin and his team have been hard at work and with the majority of the works now complete it is looking great. Few images of the spinal walls within the planting. 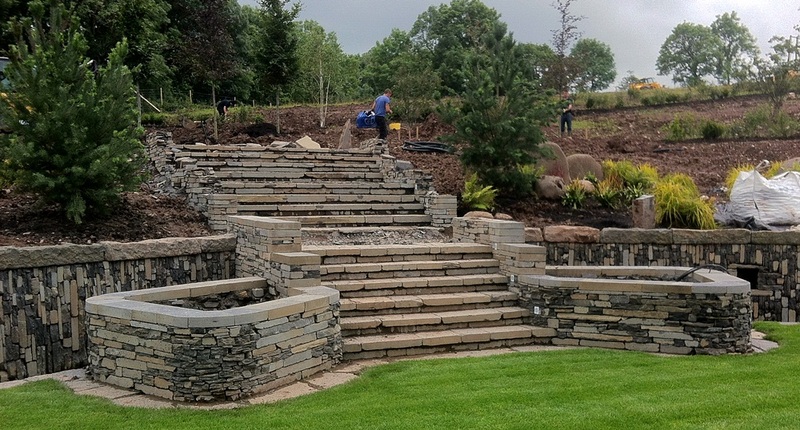 Despite the Scottish ‘monsoon’ summer – the team from Glasgow based Endrick Landscapes have been feverishly continuing with planting on site. With nearly 100 semi-mature trees and thousands of shrubs having been planted over the last few weeks, what had been a muddy brown field is finally being transformed into the garden the clients have long desired. 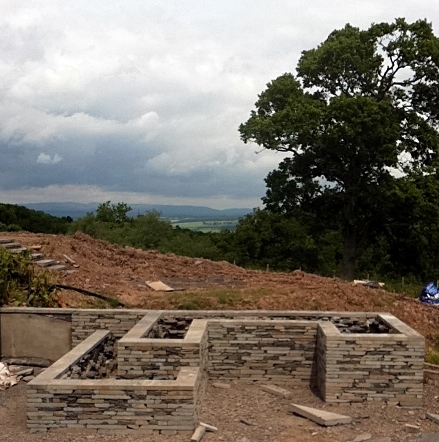 As part of the wall design scheme there is a central set of steps that will provide the clients with access to a seating area higher up on the site where the views over the Strathearn Valley towards the Highlands are stunning. These are nearly complete and the two planters that form the ends of the steps have worked out really well and will be planted up shortly. Amelanchier, lavender and fennel now provide colour and structure to the planters in the lower garden area. What a difference 2 weeks make! The annual holiday has come and gone, far too quickly, and I am now back on site in rural Perthshire. Landscaping has been underway in my absence and I have returned to see the walls beautifully set off by the freshly laid lawn. It’s crispness of line and contrast of colour shows off the walls to great effect. Still hard work ahead but beginning to see the results of all our labours. The first of two feature planters for private garden nr. Dunning. 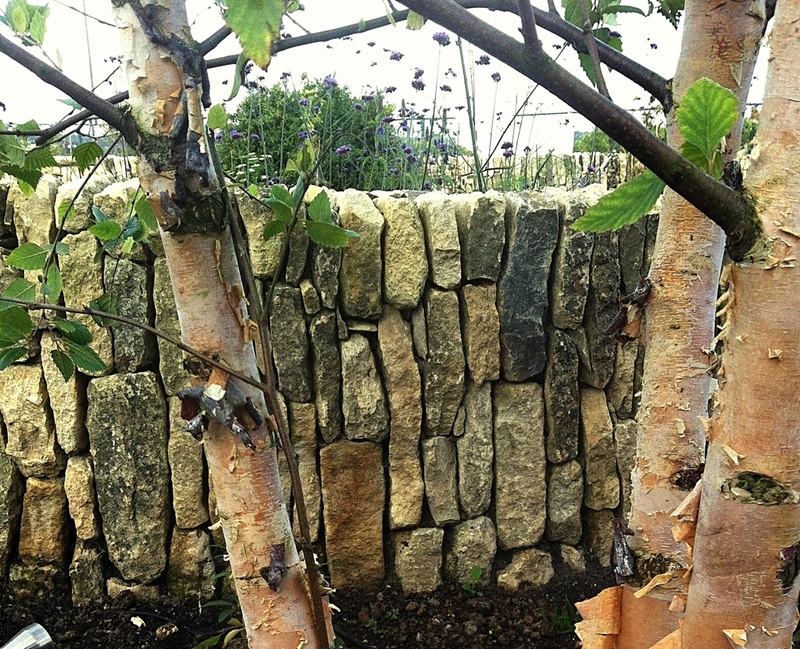 Made from caithness stone, planting to take place within next few weeks.